We have seen so many frameworks that come with their own set of custom tags. Why not create a custom tag of our own that we can use in our JSPs? 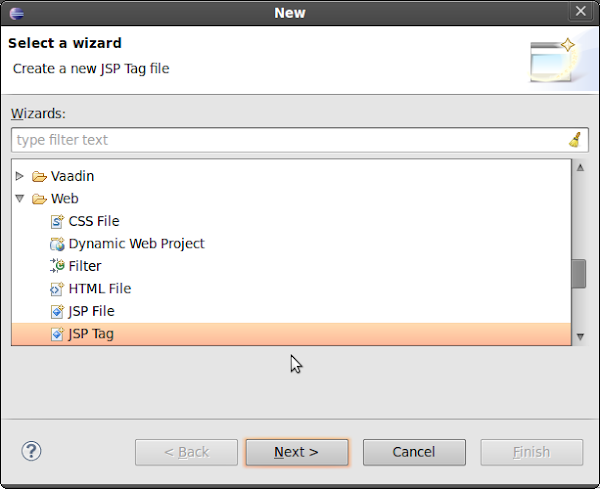 So, today we will be creating a simple custom tag to use in our JSP (2.0). Yes, I emphasize on JSP 2.0 because the process is a lot simpler and much more concise than what it was in JSP 1.x. Let us get started now. I am using Eclipse Indigo for this project. We select File -> New -> Dynamic Web Project. 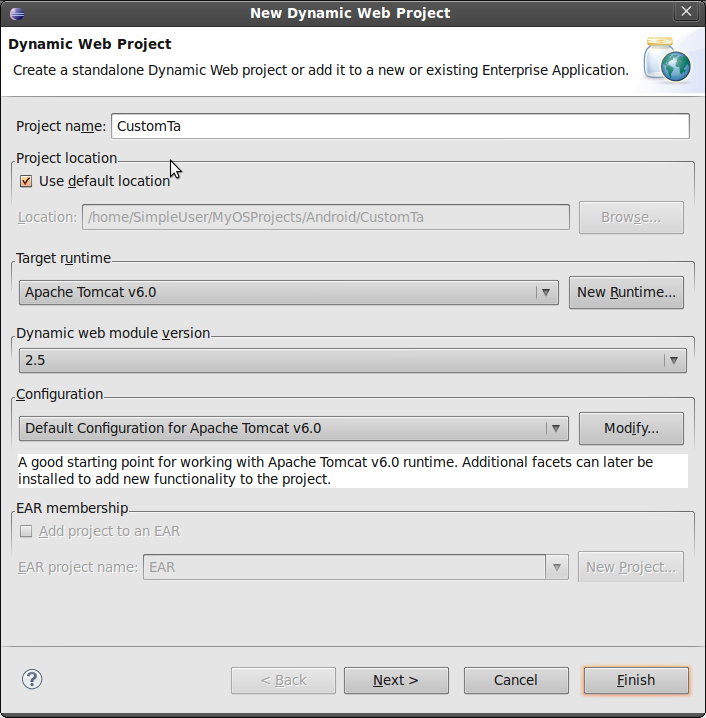 Enter the project name, and choose Apache Tomcat 6.0 as the target runtime. Step 2: Create a new file folder in the /WEB-INF directory. We need to create a new folder /WEB-INF/tags. We can do this by right clicking on the WEB-INF folder, and selecting New -> Folder. This is the folder that will contain all the custom tags. Right click on the /WEB-INF/tags folder, and select New -> Other. 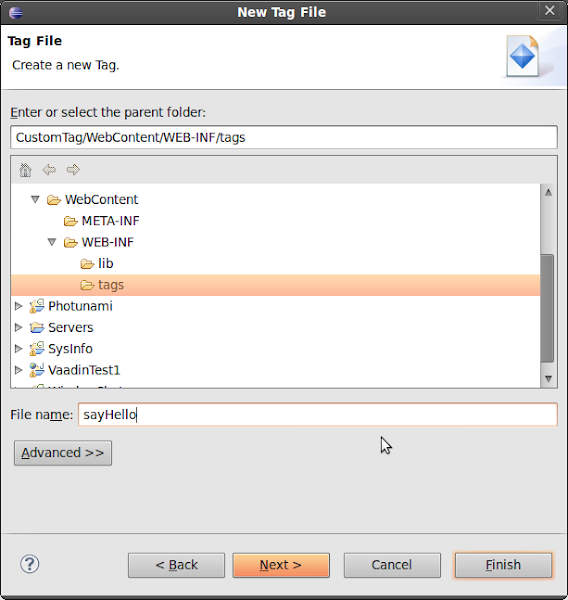 There, we scroll down to Web, and choose JSP Tag. Next, we give it a name. I call it sayHello. Once the name of the tag is chosen, I choose the Tag template. That creates the tag file. Now, we enter the necessary code to make the tag functional. A tag file is almost identical to a JSP file. So, my tag is going to take one attribute, named to. That attribute is going to be mandatory. 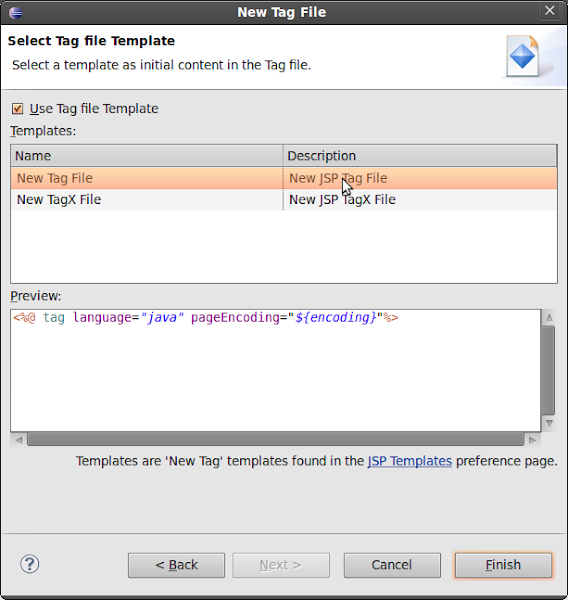 <%@ page language="java" contentType="text/html; charset=UTF-8"
There, you can now go ahead and create all sorts of tags to make your JSPs contain simpler code. If you have any reviews, comments or suggestions please do write to me. Thanks for reading. I am Hathibelagal A, a Java and Python enthusiast. You can also find a lot of code I write on Github.